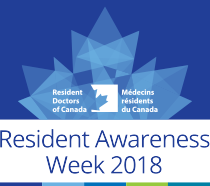 Resident Awareness Week 2018 (Monday, February 5 – Friday, February 9) is a nationwide celebration of the pivotal role played by resident physicians in the Canadian healthcare system. In addition to being learners, we are also service providers and educators. To bring attention to resident physicians and acknowledge the important work we do, Resident Doctors of Canada (RDoC) will be launching new promotional resources throughout the week. These resources include our updated Ten Fast Facts about Resident Doctors in Canada infographic, which presents important information about Canadian residents in a visually compelling way. This information is drawn from RDoC’s internal metrics as well as recent data from other national health organizations. We also have new additions to our Resident Profiles series. Since the time of this project’s launch during Resident Awareness events in 2016, we have published over 35 first-person accounts of what it’s really like to be a resident training in various specialties. From family medicine to plastic surgery to endocrinology, we’re pleased to have residents from across Canada telling their stories. We’ll be sharing these resources all week on our website, Facebook page, and Twitter, and we’ll also be sharing awareness-related material from our stakeholders, including our provincial partners. Be sure to follow the hashtags #residentawareness and #ResidentPhysician. On behalf of the 2017-2018 RDoC Board of Directors, I hope the work we are doing this week to promote resident physicians will make you proud. Have an excellent Resident Awareness Week!